Magpies, beautiful though they are, kill a lot of song birds and small animals, and so they are not very popular with many bird lovers. The glossy black and white plumage of this member of the crow family make it easy to recognise. It is resident in Britain all the year round. 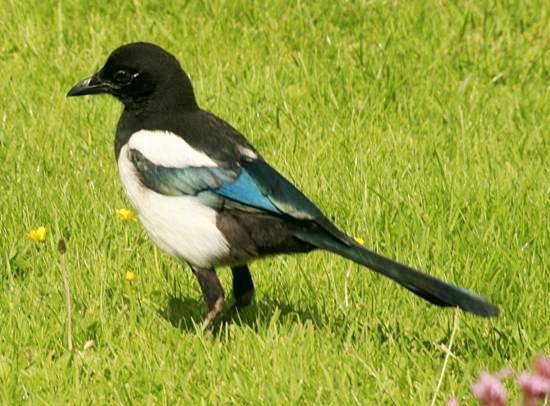 In common with jackdaws, magpies are attracted to shiny objects and are notorious for stealing rings and other jewellery left on windowsills or tables out of doors. They commonly visit gardens. 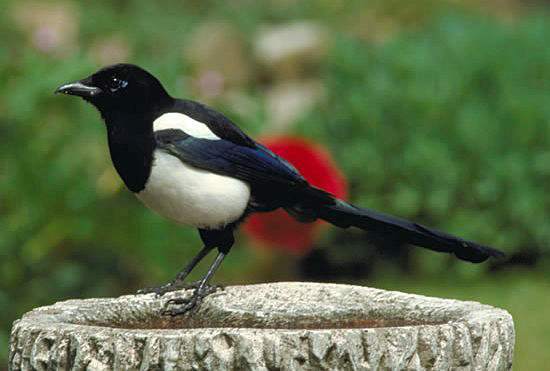 Magpies nest in trees and tall bushes, using sticks and mud as building materials. The domed nest has a side entrance hole. Between five and eight eggs is a typical brood; they are pale blue-green with brown speckles and usually hatch in April or early May.